The Airborne Forces were formed and he joined the 5th Battalion and served in North Africa , Italy (Monte Cassino), Greece, Germany and Palestine. He was wounded twice and he still has a piece of shrapnel in his back. An interesting tale is that during WWII he saved the life of (Reuters journalist) Claire Hollingsworth. James (Jim) Armstrong and his company were in Sicily during WWII and they were trying to pinpoint a sniper who had their Para company pinned down in a position. Whilst trying to locate Jim’s company Claire walked in to the room where they were held up and Jim turned around and instinctively pulled her to the ground just as the wall was sprayed by rounds from the sniper. Jim’s action saved Claire’s life. Claire is now 104 years old. 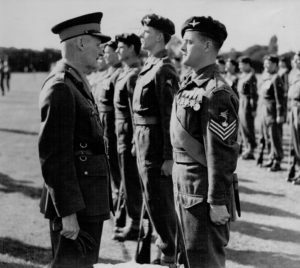 James Armstrong’s MBE was presented to him for his services to the British Army.